A recent Northwest Indiana motorcycle accident took the life of a 29-year-old rider in Lake County and left a passenger seriously injured, according to the Indiana State Police. The fatal accident happened in the westbound lanes of Interstate 90 at the 15.6 mile marker. The motorcyclist reportedly died at the scene of the accident as a result of blunt force trauma. The 34-year-old female passenger was taken to North Lake Methodist Hospital in Gary and was listed in critical condition.Our Crown Point personal injury lawyers urge you to keep an eye out for motorcycle riders during the final weeks of the riding season. Motorcyclists are more vulnerable to injury and death in the event of an accident than the occupants of a car. Riders are oftentimes overlooked on our roadways, and while they hit the road in full force over the next couple weeks we all need to be extra cautious to help avoid potentially serious or fatal accidents. According to the National Highway Traffic Safety Administration, there were more than 690 traffic accident fatalities in the state of Indiana in 2009. More than 110 of these fatalities were suffered by motorcyclists. Drivers ages 40 to 49 were most likely to be killed in an accident. The 30- to 39-year-old age group followed at a close second. Both groups accounted for more than 60 motorcycle deaths. In 2009, the death rare for motorcyclists was more than 54 fatalities per 100,000 motorcycle registrations. Now that we know just how often these motorists are the victims of fatal accidents, it’s time to focus the attention on ourselves, passenger-car drivers, to help make the roads safer and to reduce their risks for these accidents. -Always be aware of your surroundings. Keeping an eye on traffic flow will also help you to keep an eye out for motorcycles. -Always physically check your blind spots before making a lane change or before making a turn. -Always predict that a motorcycle is closer than it appears. The small size of a motorcycle can make you believe that it is farther from your vehicle than it actually is. -Don’t share lanes with motorcycles. They’re entitled to their own lane as they are required to follow the same road rules as you. -Don’t follow too closely. Motorcyclists sometimes slow their vehicle by downshifting instead of hitting the brake. This does not activate the brake light, which can increase their risks of being rear ended if you’re following too closely. -Make sure their turn signal is for real. Turn signals on motorcycles aren’t self-canceling like the ones on our cars. With greater driver awareness, we can all do our part to help reduce the risks of fatal motorcycle accidents. These riders only have a short while to enjoy the open road. Let’s help them enjoy it safely. 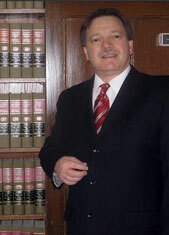 Attorney Burton A. Padove represents traffic accident victims throughout the state of Indiana and Illinois including Lake, Jasper, Newton, Porter and Cook Counties. If you have been involved in an accident, please contact (877) 446-5294 to discuss your rights.